Israeli Whist - thanoscardgamess jimdo page! This game is popular in Israel, where it is just called Whist. Unlike classic forms of Whist it has no partnerships and incorporates a bidding system whereby each player predicts how many tricks they will take. A bid in the first phase consists of a number of tricks from 5 to 13 and a suit or "no trumps", so that possible bids would be "six clubs", "eight hearts", "nine no trumps", etc. A bid of more tricks outranks any bid of fewer tricks. Also, when comparing bids for the same number of tricks, the five denominations rank in the same order as at Bridge: no trumps is highest, then spades, hearts, diamonds, clubs (lowest). When a bid is followed by four passes, the last (and highest) bidder becomes the declarer and the trump suit (if any) for the hand is determined by the declarer's final bid. Then, there is a second phase of bidding in which the other three players, starting at declarer's left and going around clockwise, state how many tricks they will each try to take. You may play it with the Gulash option, where if the bidding starts with four passes the cards are not thrown in. 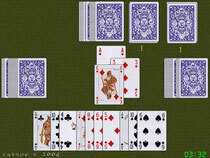 Instead, each player passes three cards face down to the left. Then the bidding starts again as before.